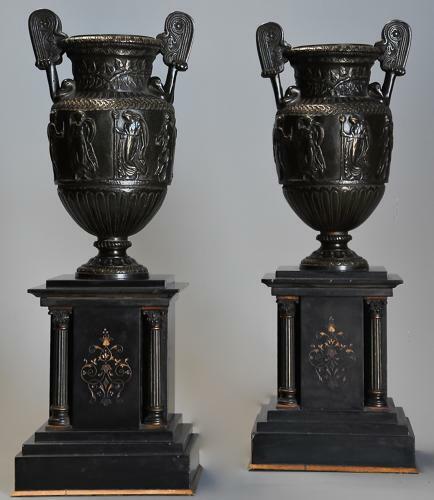 This pair of bronze vases consist of volute handles to either side in the manner of a pottery krater, the term krater meaning mixing vessel and this style of vase originally used for mixing wine with water. The vases having high relief foliate decoration and of Classical figures supported on a decorative socle style base. The vases are supported on polished slate stepped plinths consisting of a carved foliate design to the centre with fluted Corinthian columns to either side. The original Roman vase known as 'The Townley Vase' dates from the 2nd Century AD, it was discovered at the Villa of Antoninus Pius in Monte Cagnolo, Italy by Gavin Hamilton in 1773, he being the Italian agent for Charles Townley the famous antiquities collector, the original vase later bought by the British Museum in 1805. This pair of vases are in very good condition for age, are of stable construction and can go straight into a home.